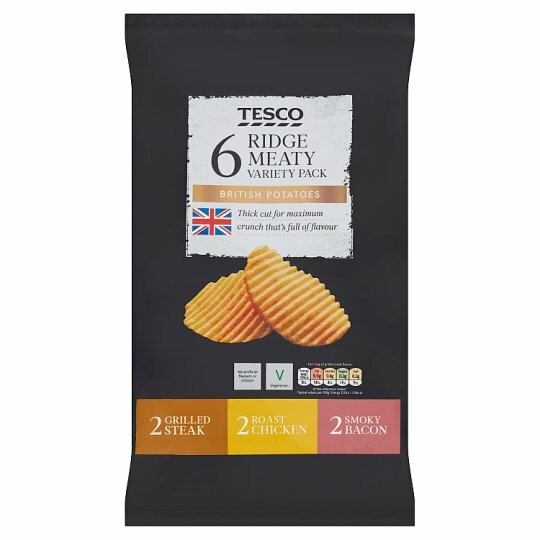 2 Bacon flavour thick crinkle cut potato crisps, 2 Roast chicken flavour thick crinkle cut potato crisps, 2 Grilled steak flavour thick crinkle cut potato crisps. Roast chicken flavour thick crinkle cut potato crisps. INGREDIENTS: Potato, Sunflower Oil, Whey Powder (Milk), Yeast Extract Powder, Dextrose, Salt, Flavouring, Sugar, Onion Powder, Sage, Thyme, Citric Acid, Garlic Powder, Black Pepper, Colour (Paprika Extract). Grilled steak flavour thick crinkle cut potato crisps. INGREDIENTS: Potato, Sunflower Oil, Rice Flour, Yeast Extract Powder, Onion Powder, Dextrose, Salt, Flavouring, Lactic Acid, Citric Acid, Colour (Paprika Extract). Bacon flavour thick crinkle cut potato crisps. INGREDIENTS: Potato, Sunflower Oil, Rice Flour, Yeast Extract Powder, Salt, Smoked Dextrose, Dextrose, Sugar, Flavouring, Black Pepper, Cayenne Pepper Extract, Colour (Paprika Extract), Citric Acid.